Live Green, Wear Black. : Persimmons - 2009! 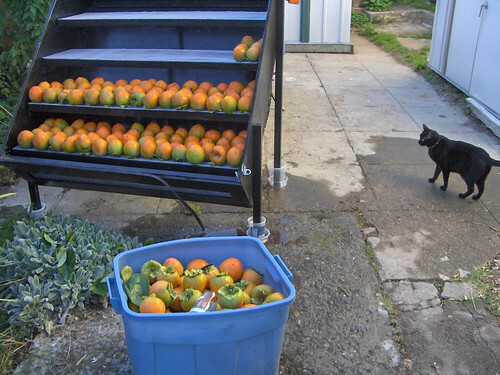 Today I went to my friend's house and helped harvest unripe persimmons. We cleared probably less than 50% of the tree - there are still a lot on the tree. It seems like more than last year - perhaps because we picked so many last year that the tree was very happy about it! I brought home two big blue tubs weighing about 75# each. 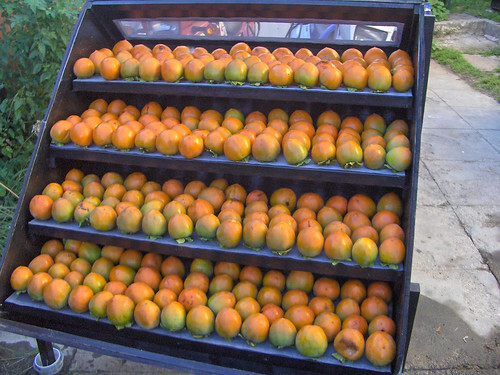 This year, instead of laying the persimmons out in a single layer on the floor and tables of my project room - I decided to utilize the solar dehydrator. The weather is cool enough and the right setup would keep the ants out - Dobson, of course, helped. Now, I just have to wait and start figuring out what to do with the ripened persimmons!